I know it isn't Autumn yet but this gorgeous image from our sponsor, Sparkle n Sprinkle ("Welcome Autumn"), was begging to be used as my DT card for the latest monthly challenge at Cards Galore Encore. I have a huge collection of both stamps and digi images from SnS and this one hadn't been used and needed to be. Below is a photo of the lattice-gate when it's closed. and the colors from Catch the Bug. Although this started with a pre-colored image, I used my ProMarkers to color the sky and to add colors to the cat, the kitten, the bird, the fence, and a couple of the squashes. I discovered that technique several months ago and love using it for different looks. The die is an unbranded die and the ribbon was in my stash. I doubled it, wrapped it around the card front, and then used two layers to make the double-loop bow. I stamped the sentiment. Oh this is a super card. Love the lattice gate, wow what a fabulous design. 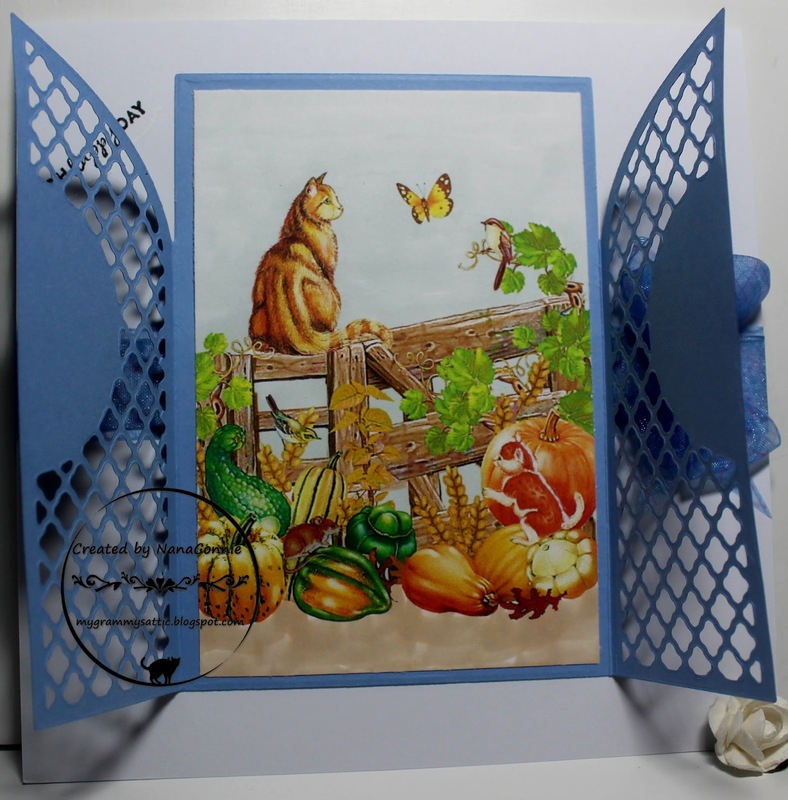 A lovely card, and I really like the garden gates - very clever! Thanks for sharing at Colour Crazy. What a Beautiful design,love the window and the colouring. What a gorgeous card!! Love the pretty design!! Thanks for joining us at DCD this week! What a gorgeous card! The image is so cute. The window die cut makes your card even more interesting. Thank you for joining Addicted to Stamps challenge.